Perogies & Gyoza: Dolphin Baby! Provided by the publisher for the 2012 Cybils Nonfiction Picture Book Award jury panel. All opinions are my own. On Sunday we took a ferry across the bay to our friendly neighbourhood volcano. On the way back we saw a dolphin frolicking near the port. This was my daughter's first experience seeing dolphins in the wild and she was enthralled! They are such amazing animals. Thanks to Nicola Davies and Brita Granström we have even more information about these brilliant creatures and their first year. 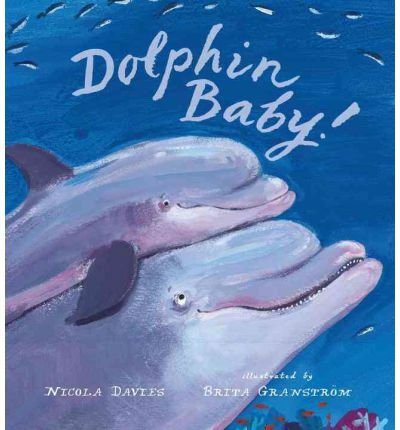 We see a dolphin from birth through nursing and his first catch of fish and beyond. The skinship is absolutely adorable. My son's favourite fact is that the dolphin's forehead is called a melon - and he loved the picture of hammerhead sharks. My daughter was shocked that dolphin mommies don't share their catch with anyone, not even their babies! I however totally understand that, nothing like having to share my last Coffee Crisp. Thinking about dolphins in our sea and how close they are to humans is a real wake-up call for my kids in regards to a number of Earth Day issues. Not only did they see dolphins, they also saw garbage on floating on the waves which spurred a great conversation about littering and how that can affect animals on land and in the sea. I hope that my kids keep in mind, not just on Earth Day but all year, how the actions of humans, even the smallest kids, can effect other creatures on earth and what a responsibility that is. This review is for Nonfiction Monday, hosted this week by A Mom's Spare Time. Great book for Earth Day! I can see that this title would be snapped up quickly in my second grade class. Love the cover.